I have been thinking about composting for about a year now. I'll be honest, at first it all seemed very complicated. I was a little put off at how much work it looked like and have pushed it out of my mind most of the summer. Finally I decided to check back into it and do more research. This second time around didn't seem quite as daunting. I've looked at manufactured composters, tumblers and homemade bins. After weighing all the pros and cons, we decided to make our own. We repurposed some wood pallets from my husbands work. Not only are we recycling, they were also free! I'll never complain about NOT spending money. We used 1 pallet for the floor, to keep air circulating under the pil,e and chose to only have 3 sides. Hubby still wants to put a door or something on the front. We'll figure that out later. I'll use a tarp to cover the top if we are getting too much moisture. I decided to go with 3 sides so that I can maintain it easily as far as watering and turning. We will see how it goes for now and modify as needed. 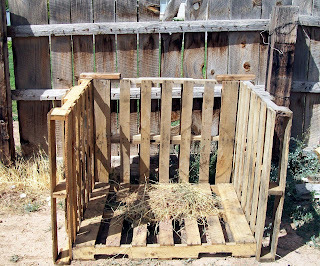 I found this great article at www.gardeners.com, All About Composting . It pretty much explains everything you need to know to make good compost, including types of bins. This is where I got the idea for the pallets. Before seeing that, I was leaning more toward a wire bin. I've started with some dead dry weeds, kitchen scraps, dirt from the garden and a little bit of grass clippings. I'm so excited to have somewhere to throw my kitchen scraps instead of my trash! It's all a lot of practice for now, but like the saying goes 'Practice makes Perfect'! 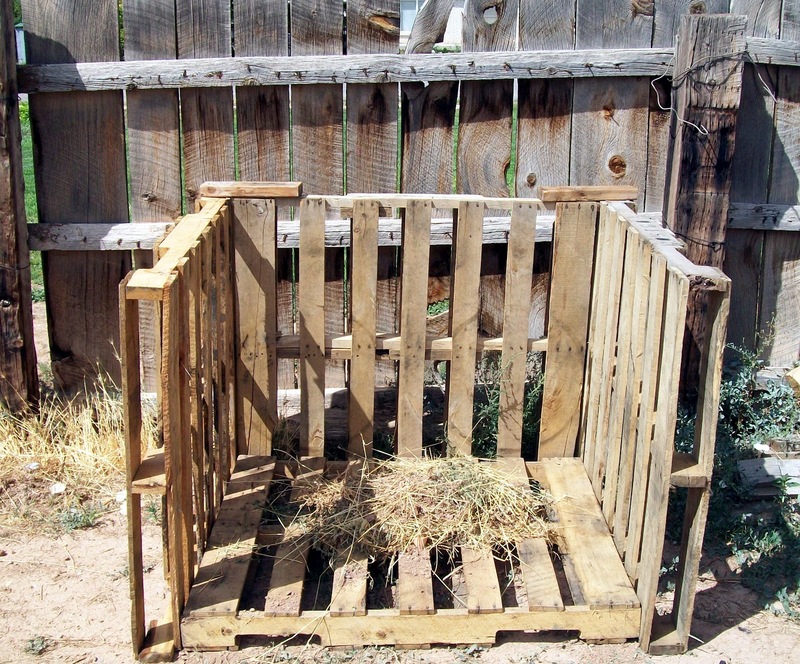 I have a three bay set up of pallet compost bins almost just like yours. I haven't put a pallet on the bottom though, just straight on the soil. Though I might give your bottom pallet idea a try,it could help with grass invasion and aeration.